Yesterday, the 18th of May was the International Museum Day and the Natural History Museum of Funchal was making guided tours and a night safari on the aromatic herbs garden, for children. Hugo and Catarina went to an evening tour to meet their good friends biologists that work for this Museum and for the Marine Biology Station of Funchal: Manuel Biscoito, Ricardo Araújo and Mafalda Freitas. 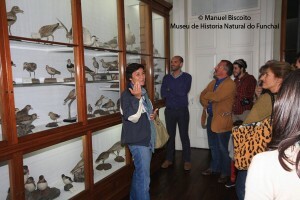 Mafalda, specialist in sharks, was leading the tour through the museum and when the group got to the birds room she invited Catarina to present it. Catarina did not refused this invitation and started to talk passionately about the breeding and vagrant species of birds of Madeira. We here thank to Mafalda for the kind invitation and to Manuel for the nice photo of that unexpected presentation!